Monitoring Employee Mobile Phones: What can employers do? If you thought an employer can only monitor employees’ computer/laptop usage, think again. Nowadays, there are apps that help an employer monitor employee activities to an extent you might never have imagined possible. Record employee calls and listen to any of them, whenever. Track their SMS (sent & received). Read email received on their phone, some services enable employers to read even gmail messages. Find out what websites employees are visiting and access their browser history. Filter what websites and apps they can access. Get notified when employees change their SIM card. Monitor social media activities including Facebook, Twitter, Youtube, Messenger services. Monitor for messages that contain certain keywords, and delete them if required. 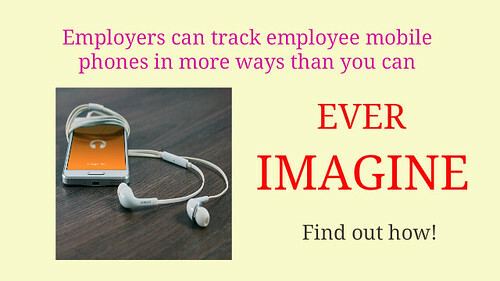 Remotely capture and record the ambient sounds from around the employee’s mobile by using the mic on their phone. Take pictures using the front and back camera of the employee’s mobile phone, remotely. Determine the location from where the employee is calling, and get to know the route which they took. Get alerted when an employee enters a certain location. View address book and calendar entries. Update, Pause or De-activate apps on their phones. Phone lock and remote wipe. Set time restrictions on when business application access is allowed. Receive alerts when employees contact certain people. It seems, most of these smart phone monitoring activity may be legal if the cell phone is provided by the employer for work purposes and if the employer declares that their mobile phone activity will be monitored in the document employees sign when they join. Some of these might be legal even on an employee owned smart phone if the company has declared BYOD policies that the employee has consented to. Is this ethical? Well, I’ve heard about some companies where they monitor employee activities without even informing them! On the other hand, some companies inform their employees that all their activities are strictly monitored, and don’t do much — the very possibility of their activities being monitored keeps employees on their check. Do you think employee monitoring is good/required? References: The One Spy, Phone Sheriff, Mobile Spy, Flexi Spy. You could stay up to date on Computer Networking and IT by subscribing to this blog with your email address in the sidebar box that says, ‘Get email updates when new articles are published’. I think monitoring mobile phone of employees is not necessary. One way to motivate workers so they do not spend too much time on their phones is to present them incentives for doing a great job instead of getting into their personal things.